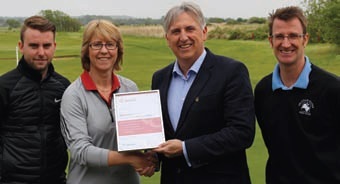 Searles Leisure Resort in Hunstanton, Norfolk is the first in the county to be honoured with the new GolfMark accolade. The GolfMark seal of approval was awarded by England Golf, the governing body for amateur golf in England and celebrates Searles’ success in helping to encourage participation in the game by making it accessible and affordable to players of all ages and abilities. Golf is just one of the many activities offered at Searles, in fact the park is buzzing with more all-action pursuits than at any other time in its 50-plus year history. “Many families today go on holiday to enjoy new experiences and we’ve responded to this by making have-a-go activities a big part of what we offer,” says Managing Director Paul Searle.